Religion East & West, the journal of the Institute for World Religions, is published every October. Its authors approach religion from a wide variety of perspectives, including doctrine, practice, ethics, history, biography and the relation of religion to other aspects of life. By welcoming voices from many spiritual traditions, the journal furthers the Institute for World Religions’ mission of promoting interfaith understanding and trust. Religion East & West champions the ideal of scholar-practitioner. Its editorial board seeks to publish articles by authors who are scholars grounded in practice or who are practitioners informed by study and reflection. The journal’s premise is that when scholarship and practice are combined, both are deepened, and that together they will inspire respect and appreciation for the manifold variety of human religiosity. Rev. Heng Sure holds a Ph.D. from the Graduate Theological Union at Berkeley. He serves as director of the Berkeley Buddhist Monastery and lectures worldwide on Buddhism, Buddhist texts, meditation, comparative religion, and interfaith dialogue. He was ordained as a Buddhist monk in 1976. Bhikshuni Heng Hsien holds a Ph.D. in South and Southeast Asian studies from the University of California at Berkeley. A Sanskrit specialist and translator, she has been a Buddhist nun for more than thirty years. Henry Rosemont Jr. holds a Ph.D. in philosophy from the University of Washington. A Distinguished Professor emeritus at St. Mary’s College in Maryland, he is currently visiting professor of religious studies at Brown University. He has published widely in the areas of Confucian studies and comparative religion. Snjezana Akpinar holds a Ph.D. in Turkish studies from the University of Istanbul. She is president of Dharma Realm Buddhist University and lectures on Central Asian infl uences on Islam and comparative studies. Martin J. Verhoeven received his M.A. and Ph.D. in history from the University of Wisconsin and is a resident scholar at Dharma Realm Buddhist University. His area of specialty is the European and American encounter with Buddhism. Ron Epstein holds a Ph.D. in Buddhist studies from the University of California at Berkeley. He recently retired from teaching Buddhist studies and world religions at San Francisco State University. Douglas Powers holds an M.A. in theology and philosophy from Graduate Theological Union and a B.A. and M.A. from the University of the Redlands. He currently teaches Western philosophy. David Rounds, editor of this journal, holds a B.A. from Harvard and an M.A. in Buddhist studies and translation from Dharma Realm Buddhist University. He recently participated in a new translation of the Surangama Sutra. Annual subscription rates for Religion East & West are $12 for individuals, $18 for institutions, and $20 outside North America. Those wishing to subscribe may do so by email to the Circulation Manager at rew@drbu.org or by mail to the Institute for World Religions, 2245 McKinley Avenue, Suite B, Berkeley, CA 94703, U.S.A. Subscribers may enclose their check or request an invoice. Back issues of Religion East & West may be purchased at $12 each from the Institute for World Religions at its Berkeley address. Religion East & West welcomes submissions from authors of all nations and all spiritual traditions. Articles are generally between 2,500 and 7,000 words in length. References are in the form of endnotes rather than footnotes or embedded citations. Queries or finished articles are accepted for consideration, as are articles based on papers delivered at conferences and similar gatherings. Queries and submissions are welcome year-round and may be sent to the Editor via email torew@drbu.org or by mail to Religion East & West, Institute for World Religions, 2245 McKinley Avenue, Suite B, Berkeley, California, 94703 U.S.A. The deadline for finished pieces is May 1. 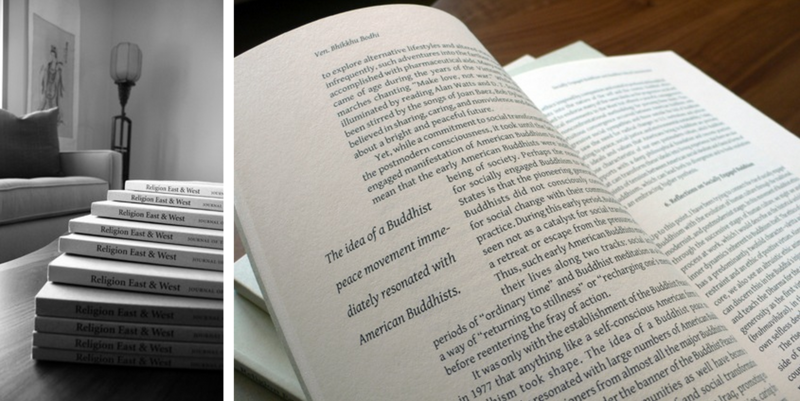 The Institute for World Religions, publisher of Religion East & West, is an affiliate of Dharma Realm Buddhist University and the Dharma Realm Buddhist Association, a nonprofit religious and education organization, which generously underwrites the Institute and the journal. Subscribers and other readers of the journal who wish to support the journal or the other work of the Institute may make a tax-deductible donation by mail to the Institute for World Religions at 2245 McKinley Avenue, Suite B, Berkeley, CA 94703, U.S.A.